Axcel Finance in Grenada has been hailed as a significant step in Government’s thrust to strengthen Micro, Small and Medium-Sized Enterprises — key pillars essential to the overall strategy of poverty reduction. At the official opening in Grenada this week, Prime Minister Dr Keith Mitchell said that supporting the establishment of micro-financing institutions, such as Axcel Finance, is a well thought out, deliberate, strategy of his government. The gathering included Hon. Oliver Joseph, Minister of Economic Development, Trade, Planning and Cooperatives, other ministers and senators of government. The Prime Minister said, “What this has meant is that, for much of the New Economy ventures and entrepreneurial activities, the traditional sources of finance are no longer available or appropriate. It is this critical need to access financing that makes the launch of Axcel Finance’s new branch here in Grenada significant.” Dr Mitchell is of the view that the New Economy will be stronger and more resilient to any unexpected financial downturns, if it is based on the citizens of Grenada taking control of their destiny by starting and growing businesses. Reflecting on the global economic crisis, Dr Mitchell said an important lesson to be drawn is the need to innovate, and to move beyond the traditional perception of income generation being only a day job. He commended Axcel Finance for introducing new innovations and for ultimately assisting in spurring the entrepreneurial spirit of the people of Grenada. Axcel Finance is the leading microfinance institution in the region with operations in Antigua, Barbuda, St Lucia, Dominican Republic, Barbados, and now, Grenada. The company has established a strong track record, credibility and a healthy client-base with dozens of highly trained, courteous and professional employees serving clients in these markets. Axcel Finance Grenada is housed in the Demerara Mutual Building on the corner of Melville and Granby Streets in St George’s. 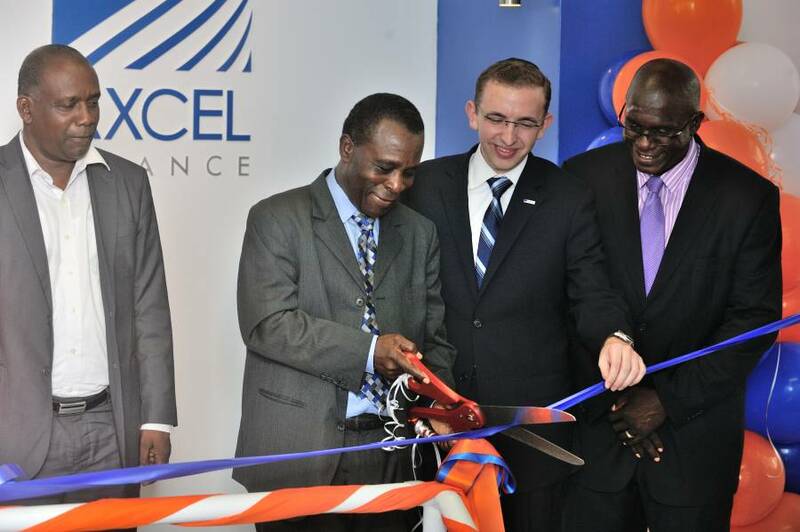 The official opening in Grenada followed the Axcel Finance launch in Barbados, in December of 2013, and last week’s opening of an additional branch in St Lucia’s southern city of Vieux Fort. Opening of the Barbados and Grenada operations is part of Axcel Finance’s growth strategy in its second year of operations in the OECS.